Your butterflies will be farm-raised according to industry standards. See the link below to the International Butterfly Breeders Assoc. of which we are members. They will be safely packed and shipped to you within the first few days of their life, ensuring high levels of health and stamina. They will be comfortable and safe as the shipping container mimics a natural resting environment for them: cool, dark and not too dry. 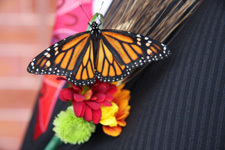 We schedule your butterfly shipment to arrive the day prior to your wedding or event. All you need to do is keep them cool until approximately 60 minutes before the release. Then just take the individual boxes out of the shipping container and put them somewhere at least 65 degrees. When they are warmed up, your butterflies will be ready to fly and join in your celebration. Never release butterflies while it's raining and never after 6pm. They need a chance to find shelter and perhaps to nectar before dark. Never leave butterflies in a car window or other extreme heat. Usually, before the release, a poem, reading or announcement is read to bring attention to the moment and the meaning of your celebration. This is an opportunity to bring everyone's focus together, to toast a couple, to honour a friend, or to simply invite everyone to pause in silence and reflection. Then the reader invites everyone to release their butterfly, or the box is opened for a mass release and soon your winged guests are taking flight. They may land on flowers if they are nearby. As an alternative to releasing the butterflies individually, some people like to release groups of them from a single container. This is called a "mass release." The butterflies you release will locate suitable habitat and will increase the numbers of the species. Even though they are raised in protected conditions, they are not domesticated. They will follow their natural instincts and seek their host plants or nectaring plants as usual. Butterflies with their long proboscis can reach into the flower blossoms deep enough to pollinate native flowers not pollinated by bees. Because they are on the move so much they can cross polinate over a large area. 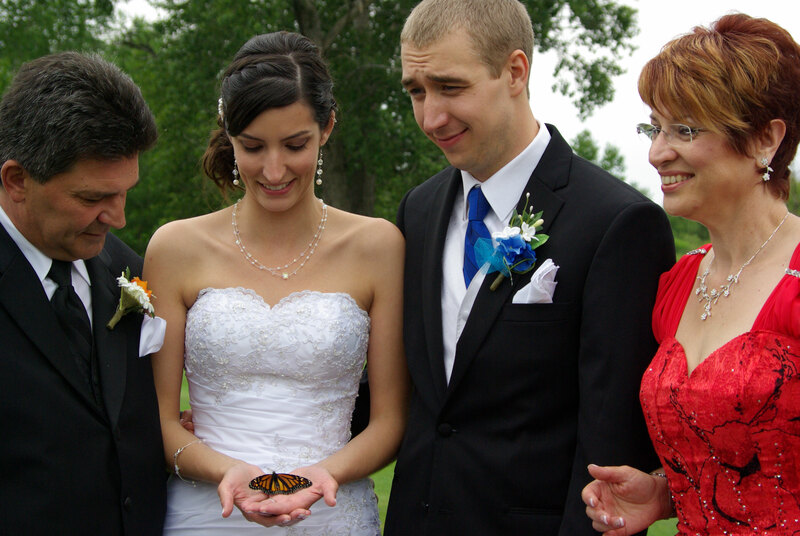 Releasing butterflies at your nuptials or special event will support efforts to replenish butterflies in the environment and reverse trends of threatened species.